Prominent & Leading Manufacturer from Mumbai, we offer copper bonded steel earth rods - 254 microns and copper bonded ground rods - 25 microns. Perfectly designed Copper Bonded Earthing Rod is designed for dissipating the fault current so as to prevent any kind of damage. This is manufactured as per internationally accepted quality standards by making use of optimum grade of materials and advanced tooling system. Copper is bonded along with steel so as to ensure a tough bonding in between steel and copper. Moreover, this range is fully covered with copper preventing any kind of crack, hole or cavity. 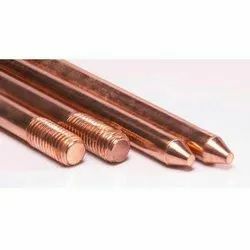 Our clients can buy this Copper Bonded Earthing Rod from us in different specifications at market leading rates.